﻿ Book Be On The Beach (Sainte Anne) - 2019 PRICES FROM $1,250! Be On The Beach is offering accommodations in Sainte-Anne. The property features a private beach area, as well as barbecue facilities. Both free WiFi and private parking are available at this property. At the guesthouse, the rooms are equipped with a closet. 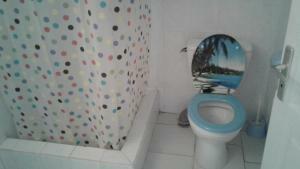 Rooms contain a private bathroom with a hair dryer, while some feature sea views. At Be on the Beach all rooms include a seating area. The accommodation has a terrace. The area is popular for snorkeling and fishing. Le Gosier is 10 miles from Be On The Beach, while Saint-François is 9 miles away. The nearest airport is Pointe-à-Pitre Le Raizet Airport, 15 miles from the guesthouse. Please note that when booking a rate where payment is due before arrival, Be On The Beach will provide detailed payment instructions, for example a link to a secured payment platform. Payment before arrival by bank transfer is required. The property will contact you after you book to provide instructions. Please inform Be On The Beach of your expected arrival time in advance. You can use the Special Requests box when booking, or contact the property directly using the contact details in your confirmation.